Labor Day weekend marks the start of a three week period that is a super fun time of year for me. Beginning on Friday with a visit to the Apple Festival, this is the kickoff of the fall season, even though the temperature is still hot (at least by our standards). 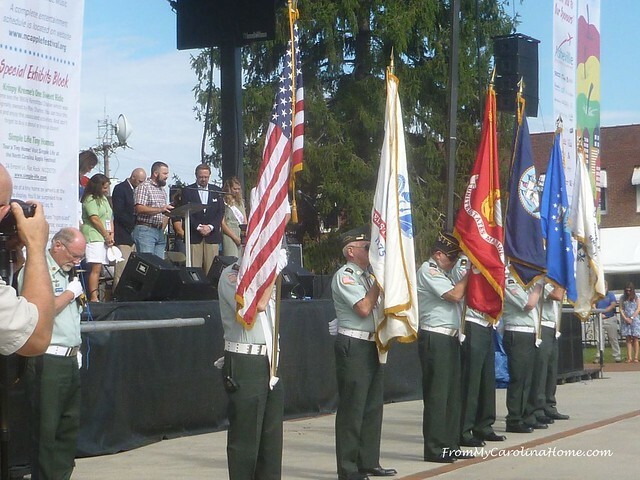 This year we went early on Friday to see the opening ceremonies, see the color guard, and hear the Mayor’s welcome. Six blocks of our small town downtown are closed off, and set up with crafters and food vendors. We wander among the tents browsing all the offerings. 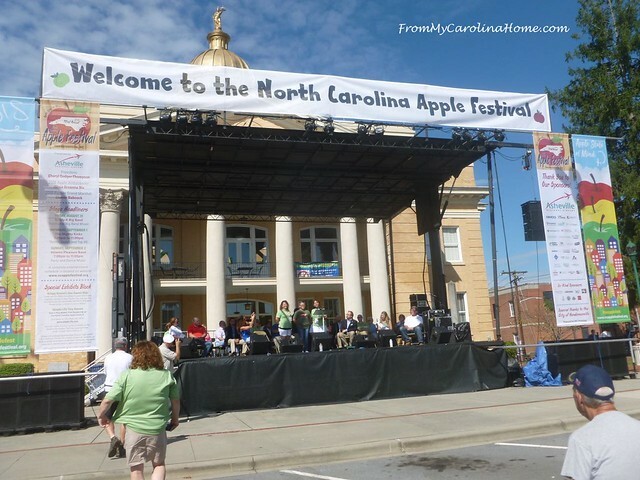 The Apple Festival has a new logo every year. 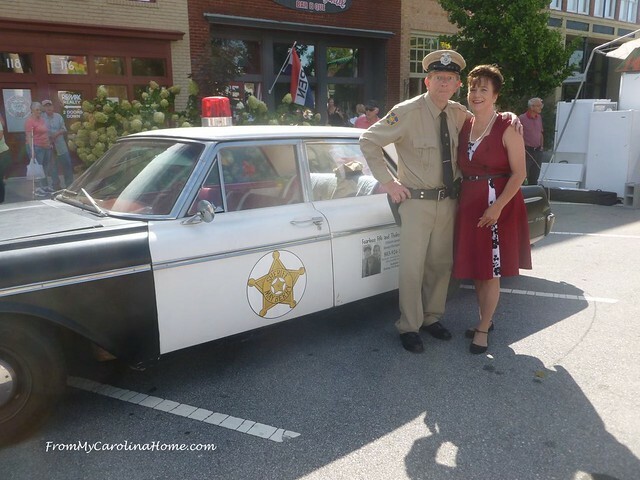 It is North Carolina after all, where Mayberry still is alive at every small town festival. 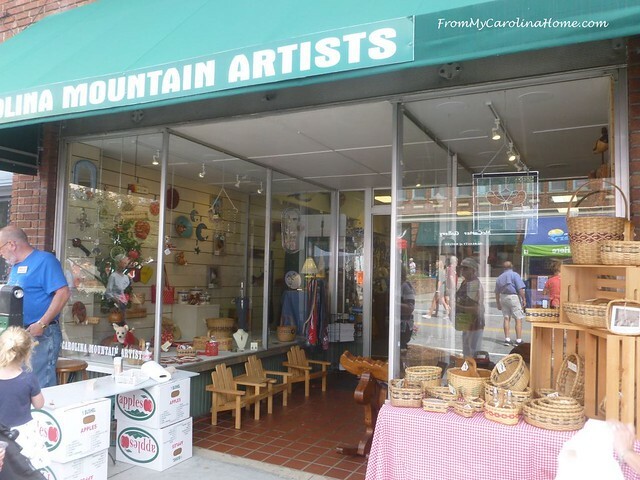 Our neighbor to the north, Mount Airy, is the birthplace of Andy Griffith Show and the inspiration for his show. I have seen more than one Barney Fife impersonators over the years too. This guy was fairly funny and had Thelma Lou with him. 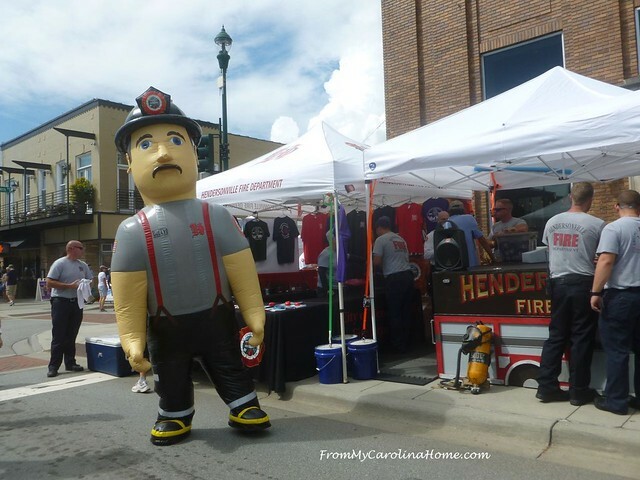 Over at the Fireman’s booth, a very large air filled costume covered a firefighter who danced in the street attracting a lot of attention. I cannot imagine how hot he must have been, but he moved to the beat of the music, looking like he was having a ball. 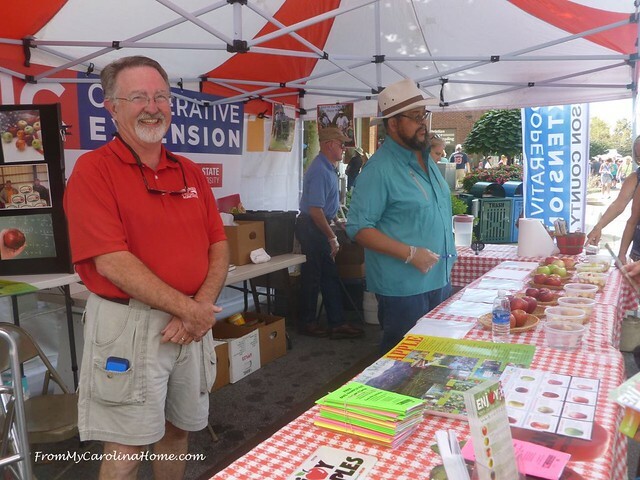 The NC Cooperative Extension sponsors a booth to teach festival goers about the different varieties of apples. They also sponsor the cooking contests at the fair. I love the way the stores along the street decorate their windows with apple themes. 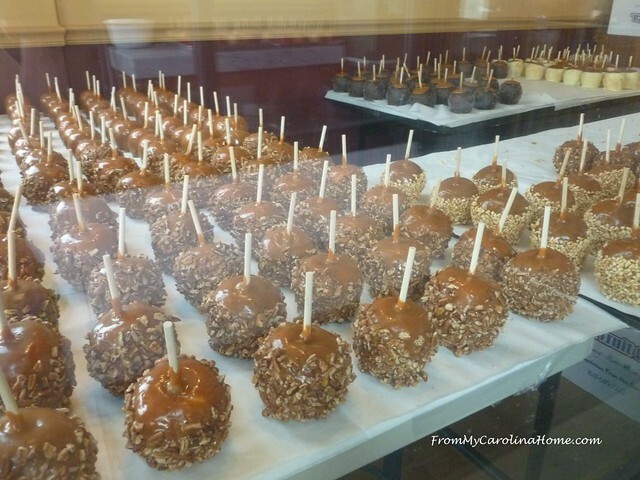 Of course, Kilwins (a local institution) had a window full of caramel apples. 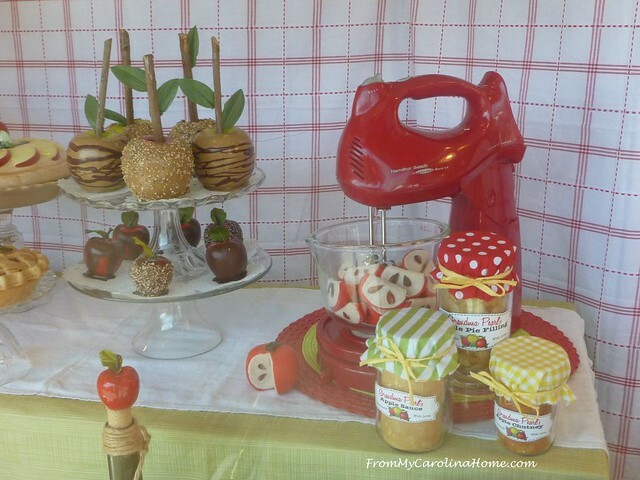 In a window, a red kitchen mixer has apple slices, and those caramel ones are decorative. 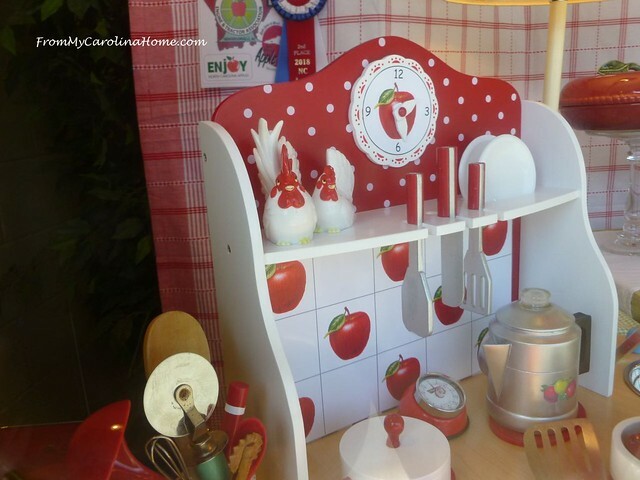 It was a full window of red apples in the kitchen at the downtown thrift store. Old books and prints were part of the display too. 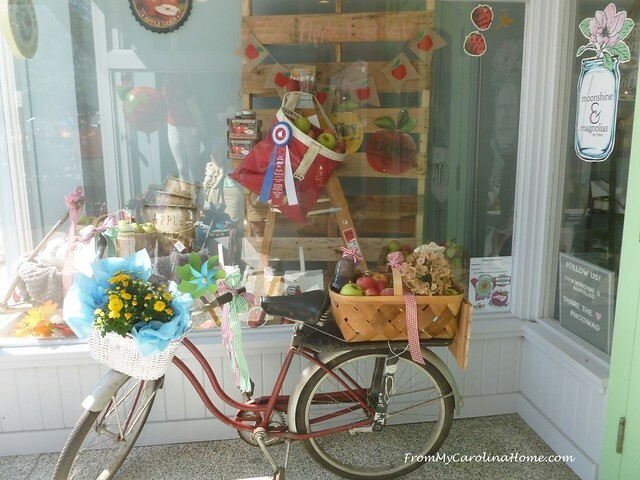 Another shop had a bicycle with an apple basket, plus lots more apples in the window display. 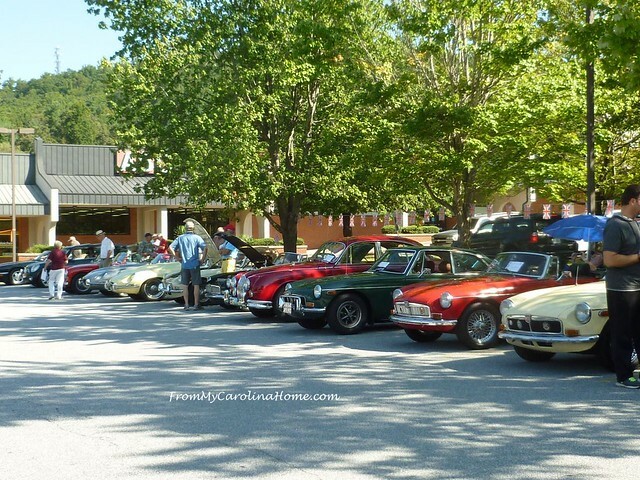 On Saturday we participated with our car club in the Laurel Park Car Show, part of the Apple Festival festivities. This was a nice day too, with lots of shade under the trees in the parking lot. 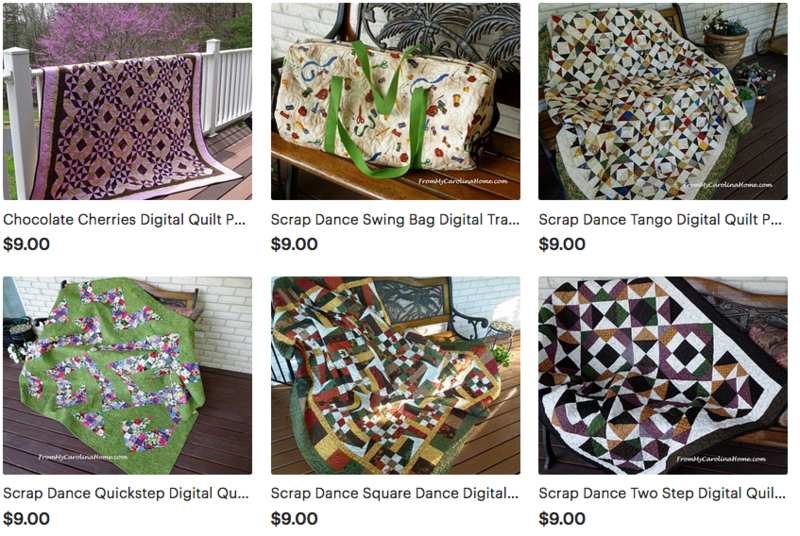 There is also a small quilt show and craft fair this weekend held by a local church quilting group, but I didn’t enter a quilt in it this year. Add to that bands and shows at the main stage all weekend, a gem and mineral show, pancake and apple breakfasts each day to benefit charities, tours of the Heritage Museum, and it is a busy weekend! The weekend festivities ended on Monday afternoon with the King Apple Parade. This is such a small town thing, and I love it. I’ll show you scenes of the parade tomorrow. How was your Labor Day Weekend? I love local celebrations. Here in Cumberland county Nova Scotia, we have strawberry festivals in July, and then late August/ early September brings us the blueberry festival. In October we will celebrate our N.S.Fibre Arts Festival. Life is so full of wonderful opportunities to enjoy our areas. Your apple festival looks like lots of fun. Your pics are most welcome. This morning mother nature is giving us a hint that fall is inching it’s way into the limelight. The risk for a light frost in low lying areas last night was that call. We are 2/2 weekends with rain! My son in law was playing with his band at a local festival and I was surprised they didn’t get cancelled. All weekend there are festivals that are being rained out. I love the banner hanging behind the tshirts. 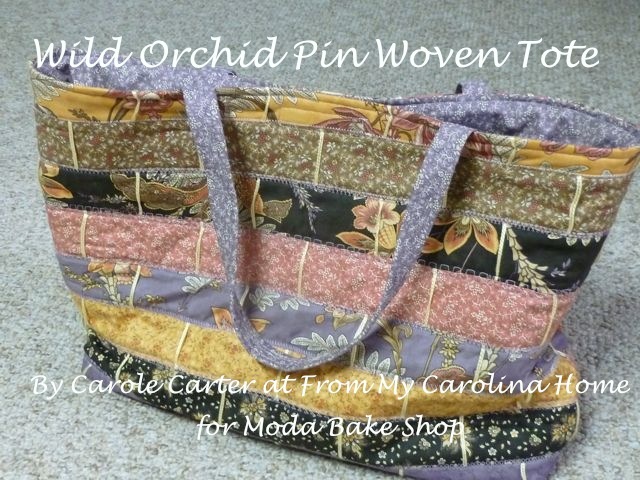 Rainy weekends mean sewing for me. Looks like you had a pleasant time. 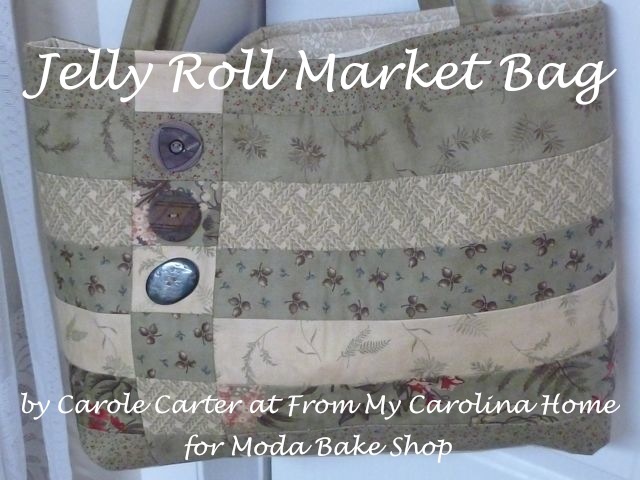 Do you wander through craft booths thinking “I can make that” ? My other daughter sent me photo’s of a stack of fabric coasters priced at $25, and I offered to teach her how to make them. They were in a museum gift shop and were made by a well known group of quilters from Alabama, and I’m sure someone would give the price knowing what the group is about etc. My husband and I were in Mt. Airy a couple of years ago and went to the Andy Griffith Museum and all of the local AG spots. Such fun! We got to sit in the car for pictures, as well as at Andy’s desk. 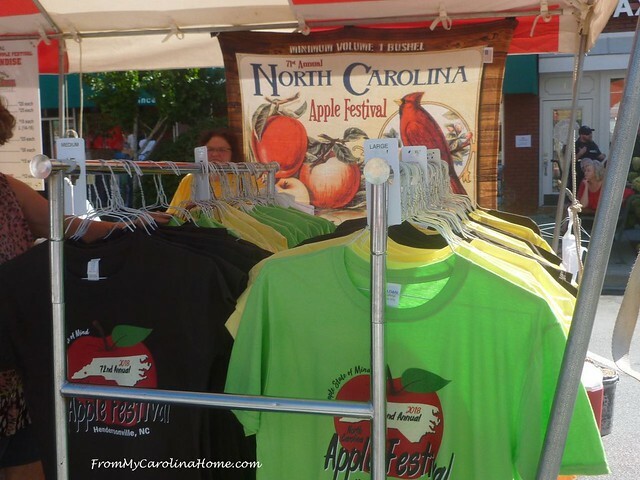 Your Apple festival looks like a lot of fun! I enjoyed all the different things you showed about the Apple Festival. Marvelous! What a fun weekend in your little town! Saturday was canning and cleaning and Sunday we made a trip to our State Fair for the 4-H Shooting Sports Hall of Fame induction. I enjoyed seeing old friends and colleagues, and a local 4-H club at home even sent flowers so I felt very spoiled. Best of all, it was a lovely day, and not horrible hot, humid weather as it often is. Got home very late and had the morning to recover before the studio opened with the first students. Summer vacation is now definitely over! What a blast. Small town festivals are so fun. Up the road 9 miles is Leesburg Virginia, really a nice town, they just built a huge parking garage near the courthouse. My daughter lives in Leesburg so we can walk to everything. If only there were more “Mayberry’s”…our grandchildren are growing up in an entirely different world. It makes me sad. I miss the days of right and wrong and consequences. Not trying to be political, just saying it’s a different country and not better for sure. We are a military family so it makes me even sadder to see all the disrespect. 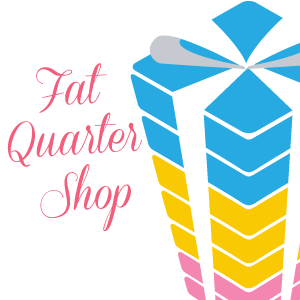 Love your blog and thanks for sharing a memory (Barney Fife was the best!). What a wonderful display, great to see everyone getting into the theme. Enjoyed your trip to the apple festival, I’ll have to check that one out on one of my traveling trips. I bought a book by Mindy B Henderson April 2009, that has all kinds of food festivals to go to. It has states, food festival of that state the month it happens etc. There is a shrimp and grits with mushrooms festival at Jekyll Island the second weekend of Sept. Fri thru Sun. I’m going to do my best to go to that one for sure next year. This book lists the festivals by state, month, and has so many recipes it is well worth the money if you can have one ordered to share with your traveling group. Ya’ll would probably enjoy all the interesting festivals. 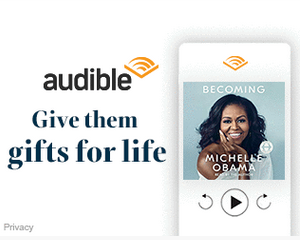 I wish I could go to all of them but some are too far for me to get to. I live in Australia. I have been to the states several times. Different places each time but always ended in Knoxville Tennessee. Actually just out of it in alittle place called Norris where our friends used to live. An historic town in itself. While in the states I’ve been to several small towns such as you describe looking in windows that looked the same buying things as I so love America. I have the strangeset affinity with America and feel so at home there. As if I lived there one time and need to go back home! 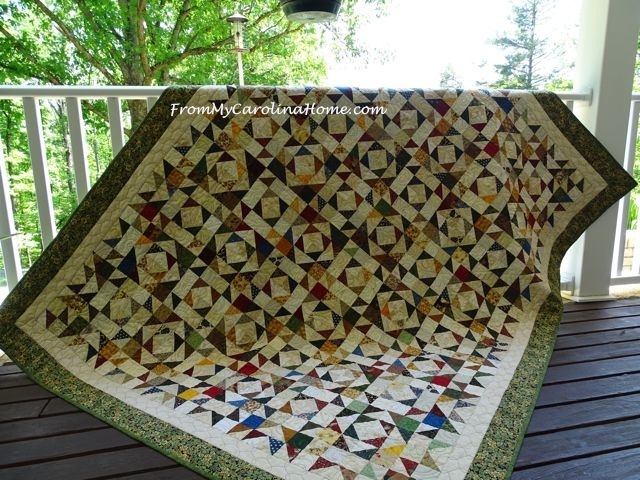 I quilt as well as other crafts I have learned while in America. Australia is so very different in every way. In Sydney where I live it is very much a beach oriented state. Eveyone seems to want to go there every weekend. Not me tho! Or one of my daughters. It’s a special place in every way different as possible from America. I love reading your blog. Thank you very much for posting it. 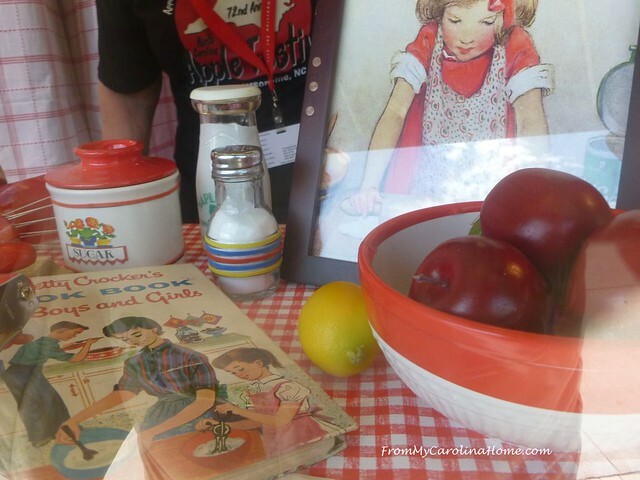 I am probably dating myself, but I have that Betty Crocker children’s cookbook on my shelf! Your post makes me want to move to North Carolina. Country Living has small pumpkins decorated as caramel apples this year, too cute. Not a lot of ghosty ghouly stuff…I like the fall them, not the halloween! Anything made of apples or pumpkin is right up my alley. Do you have winesap apples available? we got them in Front Royal VA at the cider mills. They don’t travel well so I never saw them any other place, but are the BEST and when you bite them they dribble down your face they are so juicy. Whatever happened to pippin apples? when I was young those were the green pie apples of choice, now they are all granny smith’s… not too many jonathan’s here in the west, I see some macintosh, in fact they grow better at high cold altitudes than some other varieties. I don’t like red delicious, they are mushy and I don’t think they are delicious! I have some fresh pumpkin I froze last year I need to use asap, how about pumpkin apple bread… Blast, I need to retire! 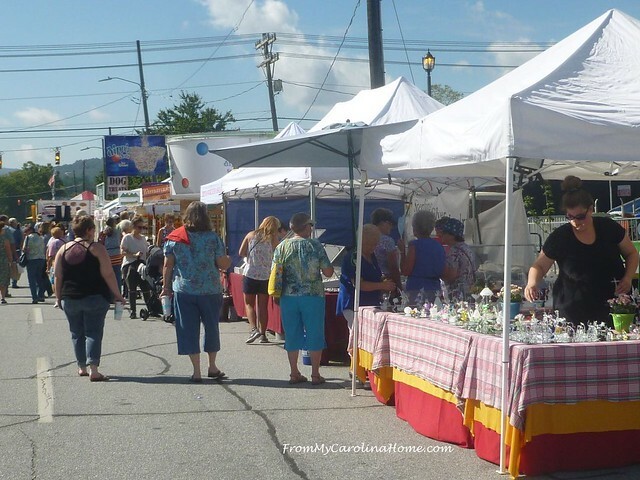 What a wonderful time to celebrate the beginning of the fall season in a small town setting with plenty to entertain and browse. Barney would have been a big hit with me–loved him in the series way back when. What a great weekend! 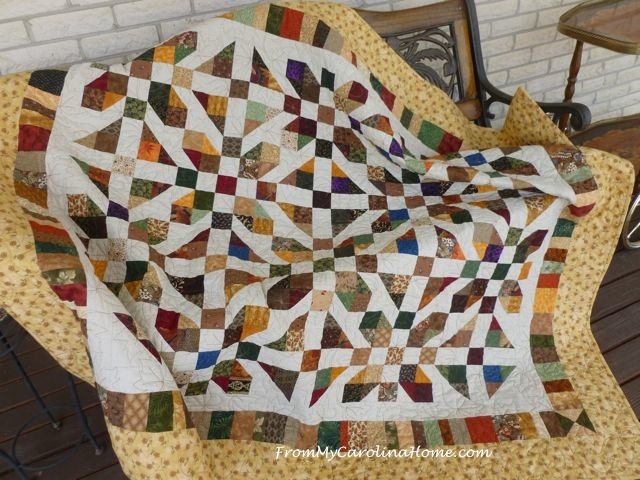 How was the quilt show? Stay safe from the hurricane! I believe you live in the mountains, away from the coast.